Where else can you find such a large selection of arrow shafts? Come in and take a look for yourself. 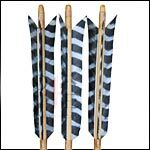 We carry Re-enactment arrows, fantasy arrows, American Indian arrows, Roman arrows, and Medieval arrow shafts with a variety of tip choices both blunt and sharp. American Indian Arrows Set of 3 pieces. 8mm diameter hazel shafts, 6 ¼" long turkey fletchings, natural nocks and flat steel arrowheads are wound with synthetic sinew.